NEWBERRYTOWN, Pa.: Kenny Edkin had some speed last season, but he didn’t finish off the 2018 campaign the way he wanted. Sure, Edkin managed two wins at BAPS Motor Speedway, which isn’t bad considering he competed against Scott Dellinger every night. But, the last time he visited Victory Lane was in the beginning of July. That was unacceptable, so Edkin and his crew went to work in the offseason to close the gap and bag more wins. It took all of one week. 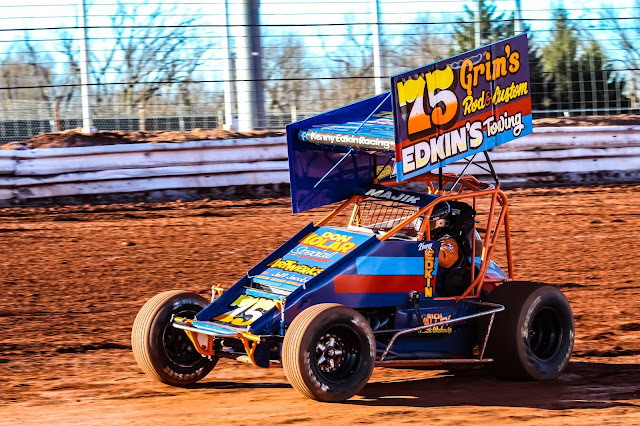 Edkin started fifth on the grid and charged to the front to capture a chilly 25-Lap Super Sportsman main event on Opening Night at BAPS Motor Speedway. “Starting the season off with a win is awesome, and it reassures all the hard work and effort put in over the offseason,” Edkin said. “I’m still elated when thinking about the win and growing up at [Silver] Springs and being there for the openers. The main event had the makings of a good one considering the lineup. Garrett Williams and Russ Mitten occupied the front row, with Justin Foster and Dellinger holding down spots in Row 2. Before the race could shape up, Chase Gutshall, who started 10th, stopped on the track. It forced a complete restart. Mitten got the jump on Williamson on the second attempt and led the first circuit. Edkin flexed early, getting past Dellinger, which played huge in the final outcome. Cautions dominated the first half of the race, with action being slowed six times in the first 10 laps. That was the only thing that stopped Edkin’s assault. Edkin surged to the front on Lap 14, getting around Mitten and setting sail toward the victory. Mitten was in line for a second-place run, but he stopped on the track on a Lap 22 restart ending his night. The red flag was thrown for a fuel stop, but it didn’t change the outcome. Edkin negotiated the tricky surface and collected the win over Dellinger, Frankie Herr, Gutshall, who came back to get fourth, and Bruce Buckwalter Jr.
“I wouldn’t say it was tricky, I would say technical,” Edkin said. “The surface was awesome. There was a bottom, a middle, and a rough patch, not really a curb where my car seemed to excel. Herr and Edkin were heat winners for the 19-car feel. Matt Ondek was the Vahlco Wheels Hard Charger, blasting from 19th to sevent. Jeremy Ott got past Mason Chaney on Lap 17 and held on the rest of the way for the victory in the 20-Lap Legends feature. Feature (25 Laps) – 1. 75-Kenny Edkin; 2. 30-Scott Dellinger; 3. 70D-Frankie Herr; 4. 1A-Chase Gutshall; 5. 83-Bruce Buckwalter, Jr.; 6. 7-Timmie Barrick; 7. 2M-Matt Ondek (Vahlco Wheels Hard Charger); 8. 8-Rich Eichelberger; 9. 14-Nate Young; 10. 71K-Tyler Wolford; 11. 35-John Edkin (DNF); 12. 77-Russ Mitten (DNF); 13. 32-Garrett Williamson (DNF); 14. 3B-Mike Enders (DNF); 15. 8M-Chris Meleason (DNF); 16. 38-Allan Hallman (DNF); 17. 20W-Davey Walsh (DNF); 18. 5D-Luke Deatrick (DNF); 19. 23-Justin Foster (DNF). No time. Super Sportsman Heat 1 Finish (10 Laps/All Qualify) – 1. 70D-Frankie Herr; 2. 7-Timmie Barrick; 3. 77-Russ Mitten; 4. 30-Scott Dellinger; 5. 83-Bruce Buckwalter, Jr.; 6. John Edkin; 7. 38-Allan Hallman; 8. 5D-Luke Deatrick (DNF); 9. 3B-Mike Enders (DNF); 10. 2M-Matt Ondek (DNS). No time. Feature (20 Laps) – 1. 10-Jeremy Ott; 2. 8CR-Mason Chaney; 3. 5-Scott Houdeshell; 4. 53-Bill Diehl; 5. 18J-Jorjie Sweger; 6. 41-Chuck Dell; 7. 30K-Seth Kearchner; 8-5C-Josh Schrum; 9. 18-Chris Transeau; 10. 75-Chandler Pagnotta; 11. 94D-Patrick Debroisse (Artwerks Hard Charger) ; 12. 93-Brent Marquis; 13. 31-Travis Beck; 14. 26-Shaun Abney; 15. 79-Ed Trump; 16. 77A-Aaron Updegraff; 17. 14W-Stephen Wurtzer; 18. 19-Travis Perry; 19. 000-Michael McClane; 20. 95-Alex Schmiedel (DNF); 21. 8-Austin Bellemare (DNF); 22. 94-Greg Burd (DNF); 23. 58Z-Zachary Settle (DNF); 24. 00-Tim O’Sheehan (DNF). No time. Legends Heat 1 Finish (8 Laps/Top 5 Qualify to A Main) – 1. 75-Chandler Pagnotta; 2. 53-Bill Diehl; 3. 58Z-Zachary Settle; 4. 18J-Jorjie Sweger; 5. 95-Alex Schmiedel; 6. 18-Chris Transeau; 7. 26-Shaun Abney; 8. 94D-Patrick Debroisse. No time. Legends Heat 2 Finish (8 Laps/Top 5 Qualify to A Main) – 1. 8CR-Mason Chaney; 2. 30K-Seth Kearchner; 3. 14W-Stephen Wurtzer; 4. 93-Brent Marquis; 5. 79-Ed Trump; 6. 99-Eric Hurst; 7. 42-Scott Lee; 8. 000-Michael McClane (DNF). No time. Legends Heat 3 Finish (8 Laps/Top 5 Qualify to A Main) – 1. 5-Scott Houdeshell; 2. 8-Austin Bellemare; 3. 41-Chuck Dell; 4. 19-Travis Perry; 5. 94-Greg Burd; 6. 1-Eugene Drew; 7. 17-Cory Phillips; 8. 88-Don Butler; 9. 39-Bonnie Lee. No time. Legends Heat 4 Finish (8 Laps/Top 5 Qualify to A Main) – 1. 10-Jeremy Ott; 2. 5C-Josh Schrum; 3. 00-Tim O’Sheehan; 4. 77A-Aaron Updegraff; 5. 31-Travis Beck; 6. 14H-Mike Howard Jr.; 7. 4-Eli Dodge; 8-43-Brandon Reiblich (DNF). No time. Legends Consolation (8 Laps/Top 4 Qualify to A Main) – 1. 18-Chris Transeau; 2. 94D-Patrick Debroisse; 3. 26-Shaun Abney; 4. 000-Michael McClane; 5. 1-Eugene Drew; 6. 42-Scott Lee; 7. 17-Cory Phillips; 8. 43-Brandon Reiblich; 9. 99-Eric Hurst; 10. 88-Don Butler; 11. 4-Eli Dodge; 12. 14H-Mike Howard; 13. 39-Bonnie Lee. No time.